By the end of the World War II, millions of people were crisscrossing in "Europe on the move", as is the title of a book by Eugene M. Kulischer. Some were fleeing from the Red Army in the East, soldiers were wandering around through burning cities and shattered landscapes, while at the same time liberated forced laborers and survivors of the Shoah were looking forward to an uncertain future. For the first time in 70 years, these flows are being surpassed now by refugees from Africa and the Middle East. While at present 1,500 refugees are distributed over the entire district with its 116,000 inhabitants, according to the report of the Mayor at that time to the American military government, in 1946 4,729 Jews, 1,531 refugees and 773 foreigners were living in Landsberg, along with its 10,178 inhabitants. Especially for Jews, it was a bitter irony of history that they could feel particularly safe in the land of the murderers. For them, Germany was to become a waiting room before the emigration they were longing for, especially to Israel or America. The immigration policy of the Americans, initially quite restrictive, and that of the Englishmen anyway, frustrated these plans for the time being. It was not until the founding of the State of Israel in 1948 that the hope for emigration was fulfilled for many. Until then, it was a matter of perseverance. The beginnings were rather ill-omened. 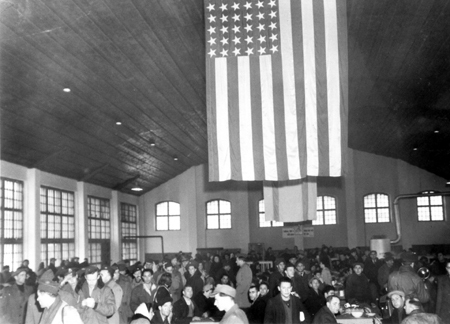 The Americans had set up a collective camp in the Saarburg barracks, where not only Jews but also other “rootless”, displaced persons (Kulischer), found a first place to stay. Among them were also Belgians, French, Dutchmen, people of all denominations. The humiliating treatment by the Americans, who had enclosed the Saarburg barracks with fences and barbed wire, came to an end after the Harrison Report had also reached President Harry S. Truman in August 1945. In Landsberg, the young US Major Irving Heymont was downright beneficial for the immigrating Jews, who in particular came from the Baltic states. At the end of 1946, Bavaria counted almost 150,000 DPs. By the time it was closed in the autumn of 1950, a total of 23,000 people had passed through the Landsberg camp, the first of a total of 184 facilities in Germany. Thanks to charismatic personalities such as Samuel Gringauz, most of the traumatised exhausted and in some cases terminally ill people soon regained confidence. And so they created their own schools, orientated on curricula in Palestine, built up their own jurisdiction, practiced sports such as soccer with Ichud Landsberg, played theatre, gave concerts, learned professions, and published one of the most important Jewish publications of that time: the "Landsberger Lager Cajtung". “Despite their often deplorable physical condition and the torture suffered by many women in the camps,” Oliver Guez noted in “The return of the unwanted”, the DPs were “extraordinarily fertile”. In 1946, some DP camps recorded the highest birth rates worldwide. According to Guez, for many Jews the high number of babies was an expression of their triumph over Germany, and almost a challenge to their “former inquisitors”. Abraham J. Peck, for example, was born on 4 May, 1946 in Landsberg, emigrated to America in 1949 and later became director of the Jewish Archives in Cincinnati. In his book “Our Zero Hour”, written together with Richard Wagner's great-grandson, Gottfried Wagner, he noted in 2006 that nowadays in Landsberg not even the slightest clue is visibly reminiscent of Jewish life in the past. The memorial plaque for the former DP camp Landsberg was donated by Irving Heymont in 1987, whose correspondence with his wife was and is testimony to the difficulties of living together with the residents of Landsberg. There was no real cohabitation, however. Quite the contrary. There was too much scepticism and mistrust on both sides. Even though it has long since been refuted, rumours are still alive about alleged revenge actions of that time. They did take place, but were far less harmful in Landsberg than in Nuremberg, for example. There, two members of the splinter group Nakam had succeeded in soaking the bread for the inmates of the detention camp Langwasser with arsenic. They had every reason to hate the Germans, but that is a different matter. Thankfully, in the course of time numerous private contacts have led to even friendly relations. Jewish-German relations have also become an integral part of public life. Basically, it's still a miracle.